In May 2014 the local and European elections take place in Ireland. 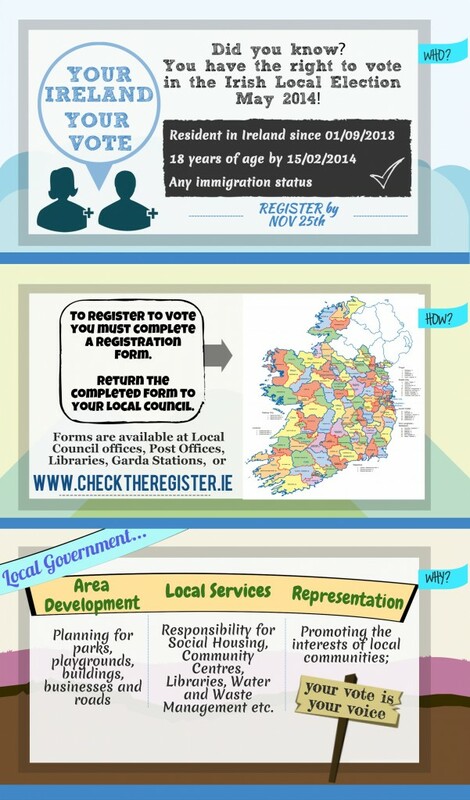 The leaflet made by The Integration Centre below gives a summary of how, where and why people should register to vote in the 2014 local election. There are still many people who are not registered to vote and decision affecting those people made without them. Registering for election is the first step to change that. Please, feel free to use the leaflet and share it with your contacts. More detailed information on the registration process in different languages is available at www.environ.ie/en/LocalGovernment/Voting/.